ANN ARBOR, Mich., January 18, 2018 – Wine consumers are demanding portable, lightweight bottles for home delivery and consumption at venues where glass is prohibited or isn’t practical. Amcor Rigid Plastics will showcase its portfolio of polyethylene terephthalate (PET) packaging at the Unified Wine & Grape Symposium (Booth #1613) Jan. 23-25 in Sacramento, Calif. Amcor’s solutions cater to needs of the “anytime, anywhere” wine consumer. 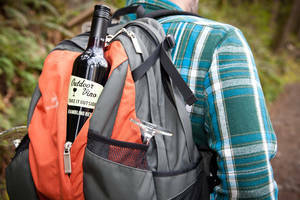 Naked Winery, based in Hood River, Ore., uses lightweight PET bottles from Amcor for its Outdoor Vino brand. Amcor’s shatter-proof and portable 750ml PET bottles play a major role in an ever-changing wine market by differentiating the Outdoor Vino brand, which is sold exclusively online. Amcor’s stock PET wine bottles are manufactured in Fairfield, Calif., and are compatible with twist-off aluminium closures. They utilize a unique barrier coating technology that delivers the portability and recyclability of plastic, with an internal glass-like barrier that protects wine from oxidation and provides a 12 - to - 18 month shelf life. Naked Winery, based in Hood River, Ore., is on a mission to cut America’s divorce rate in half by inviting couples to shut off the electronics and share a glass of wine nightly. The company’s high-quality wines enhance the romance of wine by pleasing the palate and other senses with provocative brands that change the conversation. The winery’s labels are provocative and a bit risqué because the company believes the experience surrounding wine should also be fun. In addition to the flagship brand Naked Winery®, the company offers Outdoor Vino™, a wine that lets consumers “Take it Outside!” Outdoor Vino was started in 2009 with a simple mission: to make wine more accessible to the places you love to be, from picnic tables to mountaintops and everywhere in between. The easy, screw-cap and BPA-free plastic packaging is durable, portable, and only one-sixth the weight of a traditional glass wine bottle. It’s reusable, recyclable, and perfect for those looking for an outdoor adventure. For more information, visit nakedwinery.com and outdoorvino.com. Amcor Limited (ASX: AMC; www.amcor.com) is a global leader in responsible packaging solutions, focusing on a broad range of flexible and rigid plastic packaging that enhances the products consumers use in everyday life, with 95 percent of its sales into the food, beverage, healthcare and tobacco industries. The company employs more than 35,000 people worldwide, operating in 40-plus countries and 200 sites.